Guessing is hard...Steer them in the right direction this year! Built for the well-traveled Gentleman skier, these first class gifts are bound to start new traditions or accompany old ones. Build in Detroit, from the finest components available, the Runwell is a modern classic. The perfect alternative to a scarf on a chilly day, the Alpine Winter Collar looks as at home with a sweater and jeans during the week as it does on the slopes. The Pitcher Inn in Warren, Vermont is a very special place for our team. Founder Lou and his wife were married at the cozy inn, our Director of Marketing grew up on-property, and we shot our second collection there. Of the 11 rooms, the Ski Room is our favorite. Complete with a vintage lift ticket booth and ski antiques of yore, this is the perfect place to hang your (Classic Pom) Hat between days skiing Mad River Glen and Sugarbush. 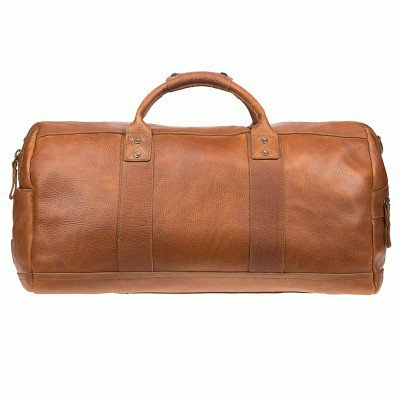 In handsome Cognac bridle leather, this weekender is perfect for a quick trip to the mountains. A true three season jacket, this waxed canvas piece features fabric from the historic British Millerain mill. We've lined it with a 10K/10K waterproof membrane, and made the hood deep enough for a helmet. Layer over a sweater or light down for skiing, and a t-shirt for spring showers. Alps & Meters Alpinist Greg Schlachter owns Expedition Broker, an adventure travel agency specializing in heli-skiing trips in the Alaska backcountry. A trip to the remote Tordrillo Mountain Lodge for an 8 night luxury heli trip sounds right up our alley. Big sound, small package. This portable, blue-tooth equipped speaker will keep you company around the campfire, or in the tiny airbnb cabin that you're renting over New Year's. Classic, nostalgic Marshall styling doesn't hurt. We swear by these bamboo face wipes for a quick refresh between an early am backcountry hike and the first meeting of the day. Made of buttery soft Nordic Elk-leather, with a Primaloft filling, these gloves definitely make it onto our list. Marrying a blended wool water repellent exterior with interior 10k/10k waterproof membrane, this timeless alpine pant draws from a rich past of tailored construction techniques while delivering the contemporary protective qualities demanded for maximum on mountain fit and protection. The folks at Juniper Ridge create fragrances using the herbs and plants they find on their hiking trips. Each fragrance has a distinct point of origin, and is inspired by the natural smell of a place. "Big Sur" has notes of sage, cedar, and Monterey pine.